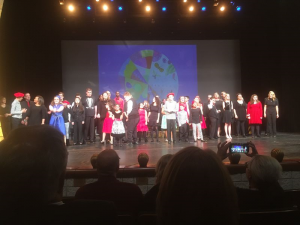 Last night we had the pleasure of attending Far Conservatory's Far Fa La La. Far is a fellow charity involved with us in the Joe Kocur Foundation For Children family. What these kids have been able to accomplish through Far will touch your heart, it certainly has touched mine. I was in tears watching these children, some of whom were non verbal prior to attending Far, get up in front of hundreds of people dancing, singing and playing instruments. The joy and the confidence that this organization has placed in these kids is truly incredible. Joe and his Foundation For Children was also honored last night for helping Far and Charities like Team Kendal Kidz and many more to make a difference in the lives of the amazing children we all support. Thank you Far for a wonderful evening and thank you Joe Kocur Foundaton For Children. We are truly blessed and thankful this Thanksgiving to be a part of this amazing family .